By the 1930s the family-owned firm of Leitz, Inc., was internationally recognized as a premier German brand. 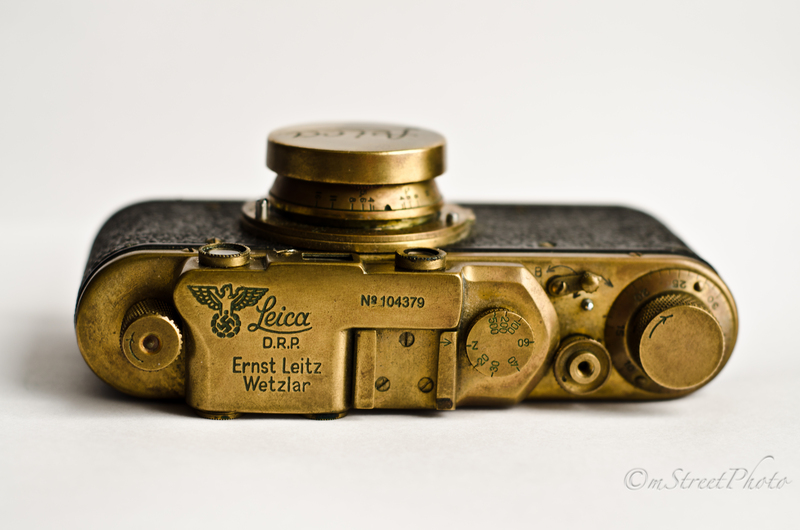 During the Nazi period, and throughout WW2, Leitz produced cameras, range-finders, and other optical systems for the Nazis. The Nazi government needed hard currency from abroad, and Leitz’s single biggest market for optical goods was the United States. It’s an inconvenient historical fact that might make many, even today, uneasy about patronizing Leica, Leitz’s corporate legacy. As with much complicity during the Nazi era, the realities can be nuanced, making moral generalizations difficult. Certainly this is the case with Leitz family and its covert efforts to support and save German Jews. Like many German industrialists during the Nazi era, Leitz family patriarch Ernst Leitz II joined the Nazi Party and remained a member throughout the 1930s. Recently however, historians have claimed that the Leitz family and Leitz as a company took an active role in quietly subverting Nazi harassment of German Jews, and many of these claims detail heroic efforts in behalf of German Jews by the Leitz family and the corporate edifice of Leitz, Inc. “The Greatest Invention of the Leitz Family: The Leica Freedom Train,” by Frank Dabba Smith, details the various ways the Leitz family and corporation acted in attempting to save its Jewish associates. Upon Hitler’s ascension to power and the implementation of the Nuremberg laws, which restricted the movement of Jews and limited their professional activities, Ernst Leitz II began helping Jewish employees, acquaintances and families leave Germany. Leitz established what has become known as “the Leica Freedom Train”, allowing Jews to leave Germany in their role as Leitz “employees” assigned overseas. Employees, retailers, family members, friends of family members were “assigned” to Leitz sales offices in France, Britain, Hong Kong, and the United States. After Kristallnacht in November, 1938, these overseas assignments intensified. Jewish “employees” and families would be sent by sea to New York, where executives in Leitz’s Manhattan offices helped them resettle and found them jobs in the New York photo industry. Many new arrivals were given a Leica camera and paid a stipend by Leitz until they could find work. This “Leitz Freedom Train” reached its greatest urgency in 1938 and 1939, delivering groups of refugees to New York on a regular basis. At the time of the Nazi invasion of Poland on Sept. 1, 1939, when German borders were closed, hundreds of Leitz Jews had escaped to America with the covert assistance of the Leitz family and Leitz Inc. Out of this humanitarian migration came many designers, repair technicians, salespeople, marketers for the American photo industry and writers for the American photographic press. Leitz’s actions in behalf of German Jews were not without consequences for the Leitz family and company management. The Nazis jailed Leitz executive Alfred Turk for friendliness toward Jews and freed him only after a large cash payment to the Reich. The Gestapo imprisoned Ernest Leitz’s daughter, Elsie Kuhn-Leitz, after they caught her helping Jewish employees cross into Switzerland. She had initially fallen under suspicion when she had attempted to improve the living conditions of 800 Ukrainian slave laborers who had been assigned by the Nazis to work in theLeitz’s Wetzlar production plant. After the war, Kuhn-Leitz received numerous honors for her humanitarian efforts, among them the Officer d’honneur des Palms Academic from France in 1965 and the Aristide Briand Medal from the European Academy in the 1970s. Why are Leitz’s honorable actions during WW2 not more widely known? According to writer Norman Lipton, the Leitz family desired no publicity for its heroic efforts. Only after the last member of the family was dead did the “Leica Freedom Train” finally come to light. This entry was posted in Famous Leica Users, Film photography, Leica, Leica History and tagged Leica and WW2, Leica History on January 13, 2015 by Leicaphila.